What exactly is the meaning, here? Srila Sridhar Maharaj: From brahman conception, the different installments follow. In brahman realisation, there is a ‘mass’ of consciousness: ‘all-consciousness’. Then, the nest step will come: the consciousness is of individual character – with deeper vision, individuality is added to consciousness. There is consciousness plus individuality. In fact, no consciousness can exist without individuality, without personality. So, the consciousness is personal; personality and consciousness, they cannot be separated, one from the other. What is differentiated from personality, that is only the halo of the personality – it is something like that. And that ‘halo’ – that brahman – is also the combination of minutest personality, of souls. ‘Purusottama’ means Vasudeva. So, bahunam janmanam ante…; after many births, when the jñanis, those of the impersonal school, come to understand that the Prime Cause of the consciousness of their quest is a personal one, then they come to conceive of Vasudeva. Generally, it is the fate of the jñanis to climb up to the highest position with great effort, and then, when they cannot grasp that ‘consciousness’ means ‘person’ – they cannot cross that understanding – they have to revert back. They have to come back, fall back. And for those who can cross this line, who can understand that: “Yes, consciousness means person – a Big Personality. 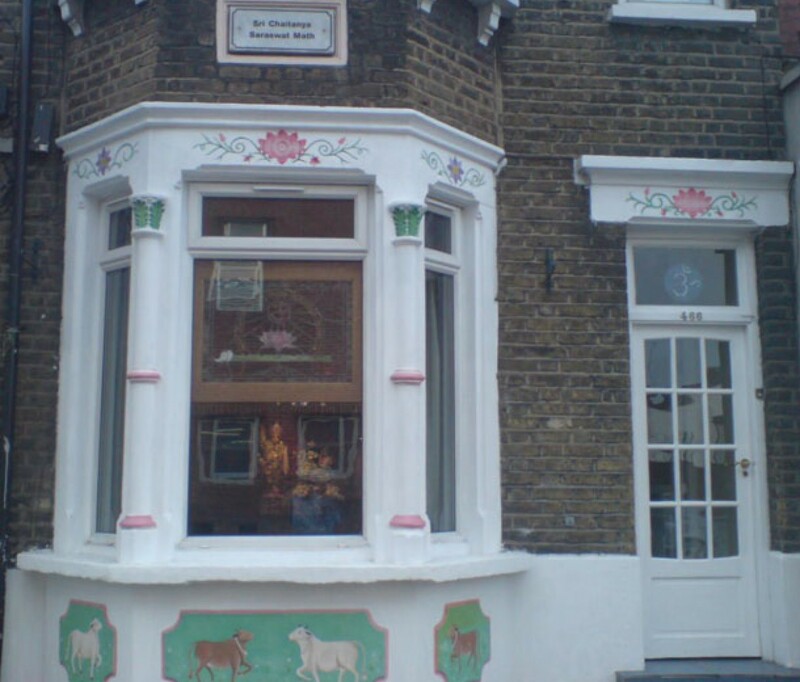 I am small…;” bhakti begins there. The relation of subordination of the lower to the Higher, that comes into effect. And, sa mahatma sudurlabhah – such a person among the jñanis is very rarely to be found, who can take the positive connection of the higher aspect of life. Mostly they come back, they have to come back from there. After much penance, they climb up to that high mark, but they cannot accommodate that “the higher entity must be dealt with devotion,” so they have to come back. But those who realise: vasudevah sarvam iti, that Vasudeva – Purusottama – is personal, they can ‘cross the line’ and enter Vaikuntha, the service area proper. And there, we are told, gradually as their vision grows more and more, they can find potency on the side of the personal God. Then they become the devotees of Lakshmi-Narayana, and enter completely into Vaikuntha-seva. And in that service, we find awe, reverence; there are sastric (scriptural) rules, and also examples of the higher-realised souls, to guide them. And in that Vaikuntha-seva, if the soul does not find the whole of his innate nature having full engagement, there will be some sort of thirst, some inner tendency which cannot find any corresponding relation to satisfy itself. And when he feels this kind of urge from within, he has to search after another, for a purer, more friendly service than the filial service. Then he can see that what was (initially realised as) brahman; then Paramatma, or Vasudeva; then Lakshmi-Narayana, that has gradually come to him as Krishna consciousness, not Narayana consciousness. Superceding Narayana consciousness he comes in contact with Krishna consciousness of the Reality. He is awakened – he finds himself awakened in a plane where he sees the all-connecting, all-harmonising principle is no longer Narayana, but Krishna – He is showing Himself as Krishna. Then he is fully awakened, and at the same time he sees that the environment, and the object of his search, is also fully equipped. This is full-fledged theism. Full-fledged theism – where the theistic conviction receives its satisfaction in the fullest way. Just as, with the opening of the eye we can see the world, and according to the degree of out sight we come to see the subtlest thing of the environment, so also, by our inner awakenment of the fullest type, we come to a particular world, environment, and that is Vrindavana – Goloka Vrindavana, the land of love. And movement there is spontaneous; and all around, we find the environment only friendly. It is so simple, so friendly; and the dealings of all who are there are filled with so much intimacy. And in Vrindavana we will find that our thirst for any higher change of environment, of association, no longer needs to be quenched; but there is thirst, eternal thirst, for coming in closer relation with them, closer connection with them. There is no possibility of any higher change of environment – where he has reached is almost final – and now the only remaining thing, is how to come into a more and more close connection with the environment. And that becomes the initiative of our movement there: more and more intimate connection with the environment. The environment is eternal, but in the intimacy of connection – the ‘competition’ (in loving service), the movement, is there. And the guidance is given according to that. In this way, there is progress. There is some sort of ‘necessity’, by which the service is moving. And, there is repetition – a kind of ‘repetition’, but it is ever-fresh, ever-new! It is ever-new, and it is only a question of the time. For example, every day when I am hungry, in the morning, food is tasteful to me, and not always – by the movement of the time, it is like that. In this way, everything is palatable, not stale. In that plane, there is movement of time, but it is eternal. It is managed by yogamaya in such a way. And finally, there we will attain the fullest satisfaction of all the inner parts of our system, the wholesale satisfaction of every atom of every constituent part of our spiritual body: priti anga lage kale, priti anga mora – “Every part of my every limb, cries for union with the corresponding part of every limb of the other side.” Sambandha – relationship with the environment – may come to such a stage, that every atom consistuting my spiritual body and mind, will aspire after union with every corresponding part of the environment. In this way, in such a friendly way, so many are moving there, and it is adjusted accordingly by yogamaya. And this is the highest conception. This is possible only in consorthood relationship, where every atom has been embraced, captured, by coming into the most intimate connection with Him. It is called adi-rasa, or mukhya-rasa. The name of Madhurya-rasa is adi-rasa, that is, it is the most original, it is the source of all other rasas, and all other rasas are dependent on it. So it is called ‘adi-rasa‘. And, mukhya-rasa: the sum total of all ‘rasas‘ – their gist, their essence, is represented here. We are told like that. And Mahaprabhu came with this gift – madhurya-rasa. It is anarpita charim chirat, “that which was never distributed before” – that of which, it is considered, any distribution was not possible previously, before Him. 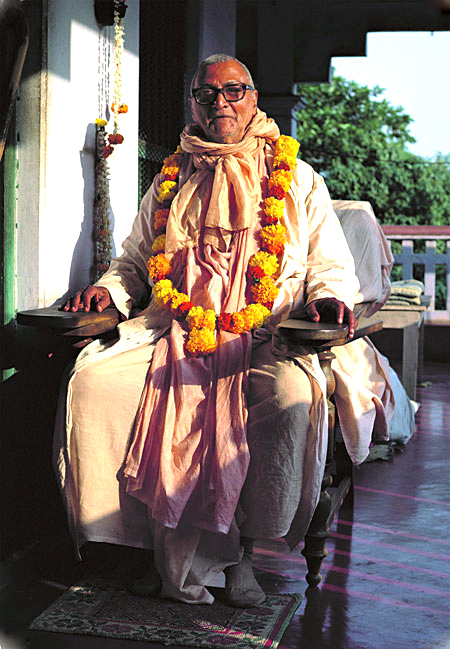 In Bhaktivinode Thakur’s book Jaiva Dharma, we find that one Vaishnava is asking his Gurudeva; “Devotion, it is eternal; but why do you say that it came from Mahaprabhu?” Then his Guru, Paramahamsa Babaji, is saying, “I visited Vrindavana and asked the eternal servitor of Sri Chaitanyadeva, Sanatana Goswami: “This anarpita charim chirat – “which has never been dealt with before” – what is the meaning underlying it?” Then Sanatana Goswami replied: “Bhakti is eternal; in ‘Narada-bhakti-sutra‘, ‘Sandilya-sutra‘, all such scriptures, this has been given – but the type of devotion which Mahaprabhu came with, which we meet after the advent of Mahaprabhu Sri Chaitanyadeva, that was not previously at any time open to the ordinary person. So, it is called ‘anarpita charim‘. And what is that standard of devotion? It is this: complete surrender to Krishna in consorthood, where every atom of the jiva-soul gets welcomed and embraced by the corresponding atom of Krishna consciousness – madhura-rasa. That was not open to the public before. This is my finding, my faith. 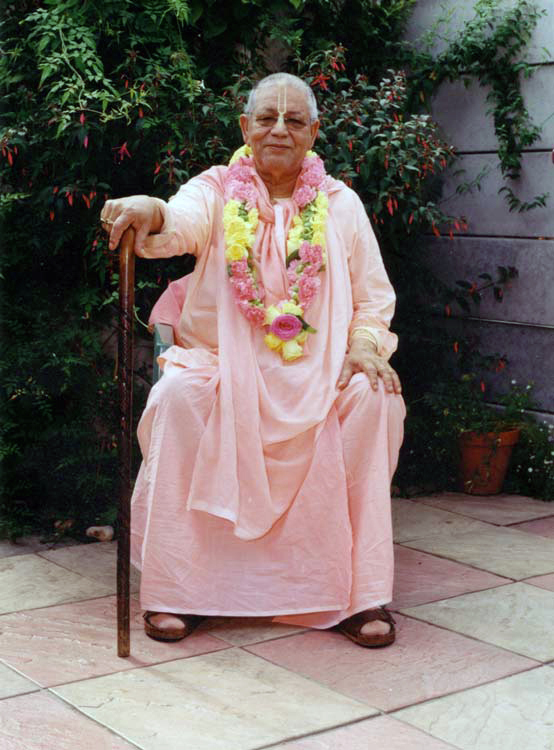 You may accept, or not accept…” Sanatana Goswami told like this to that Vaishnava: “This is my prvate conception – you may take it, or not.” This was his reply. So devotion has its beginning; the beginning of devotional life is here, where Krishna says ‘vasudevah sarvam iti…‘ (“I, Vasudeva, am the source and substance of all that be” – Bg 7:19). Then, the beginning of bhakti, the primary admission into the devotional school above jñana (knowledge) and vairagya (renunciation), that is santa-rasa (‘passive’ relation with the Lord). And from there, the gradation: dasya-rasa (servitude); then sakhya-rasa(fraternity); then vatsalya-rasa (parenthood); then madhura-rasa (conjugal love). All this is given in details in Ramananda-samvada. In this way, bhakti is going up. Systematically, we are to understand, and digest, digest what is bhakti. But, in the beginning, we are to have a broad conception of the positive world, the world of dedication. 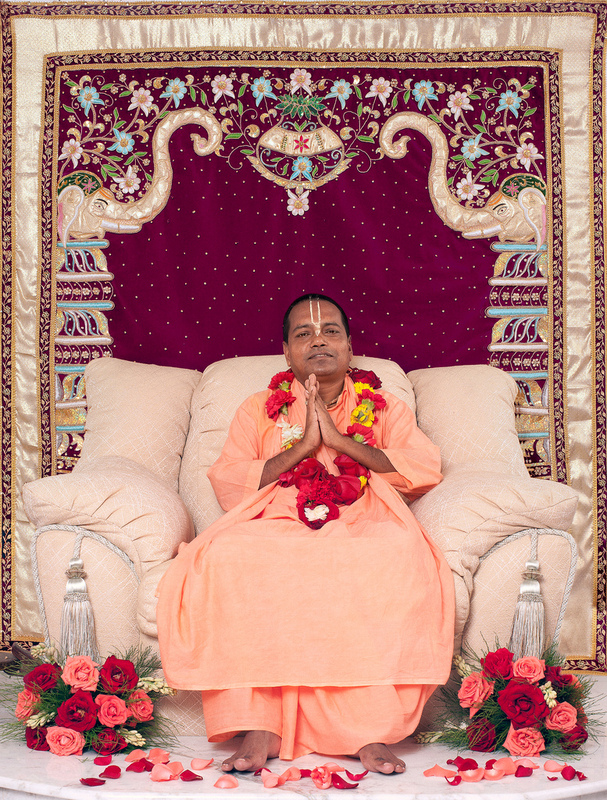 Srila Guru Maharaj increases faith in the heart of a sincere seeker. His words must penetrate the heart because they are free from personal interest and his heart living in devotion. He is the soothing rain to the blazing fire of our existance. I pray his words will stay in my heart for ever.